Two thousand cub. metres of spoil removed, 1000 cub. metres of concrete poured, 825 metres of drainage laid and 940 metres of precast concrete slabs installed. 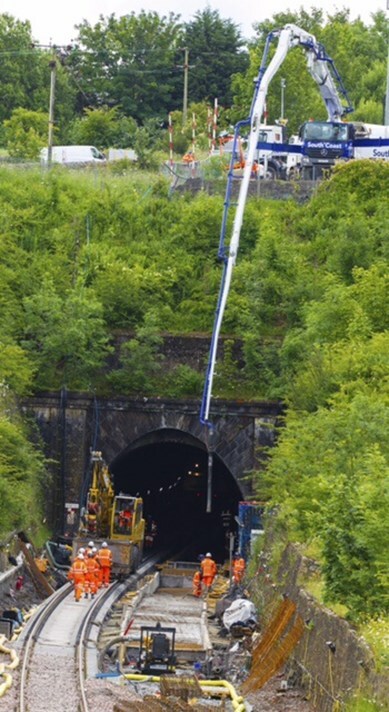 Those are the statistics for Winchburgh Tunnel which has reopened on schedule after a 44-day closure. Passenger rail services returned to normal today (Monday) after completion of a £17m scheme described as “the most significant piece of engineering on the line since the Victorian era”. Work continued 24 hours a day. Engineering teams worked in shifts 24 hours a day to lower and re-lay track through the 330-metre long structure and to install the equipment that will enable electrification of the line. The works are a crucial element of the £742m Edinburgh Glasgow Improvement Programme (EGIP). Conditions in the tunnel meant arrangements were put in place to continuously monitor and preserve the air quality. An underground communications system common in mining environments was employed and there was also a need for increased health screening because of the risk of contracting Weil’s disease from the potential presence of rodents in the tunnel. Other health and safety measures included limited shift lengths, detailed planning of rest days and reducing exposure to hand arm vibration syndrome through careful selection of plant and an increased number of automated processes and equipment.